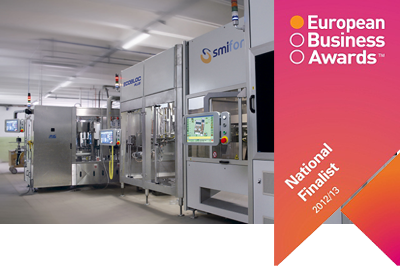 SMI is a finalist of the European Business Awards! SMI has been selected among 30 Italian finalists in the European Business Awards 2012/13. In particular, SMI competes in the category "The UKTI Awards for Innovation", reserved to European companies who have distinguished themselves for their efforts in developing innovative solutions as a strategy to influence the ongoing business development. The European Business Awards is the most prestigious European award competition for companies; this award, totally independent, is supported by organizations committed to the promotion of business goals focusing on economic, industrial and environmental development in the EU. After the first round of judging, only 627 companies have passed the initial assessment process to become national finalists in their respective countries among more than 15,000 companies participating to the contest. SMI is participating with the SACS (Stella Alpina Cost Saving) project, a compact bottling line which saves money to the end user and respects the environment. Paolo Nava, President & CEO of SMI, commented as follows: "It's a great honour for SMI to have been selected as a finalist in the European Business Awards contest. This nomination is a further international acknowledgement for the innovative technologies we have brought in the packaging industry, thanks to which we are now able to provide our customers of the food & beverage sector with complete packaging solutions and systems devised to allow cost and energy savings and low environmental impact." Adrian Tripp, CEO of the European Business Awards, says: “This is the first year that the European Business Awards has introduced the National Finalists phase of the judging process. This new selection process was introduced for two main reasons; first, it gives entrants a greater opportunity to see their achievements recognised in front of peers, politicians and media within their own countries and, second, it gives the judges greater access to the organisations in order to determine a more accurate picture of the very best in European business. As organisers of the awards, we believe this improved strategy further positions the European Business Awards as the most respected and significant awards programme in Europe”.